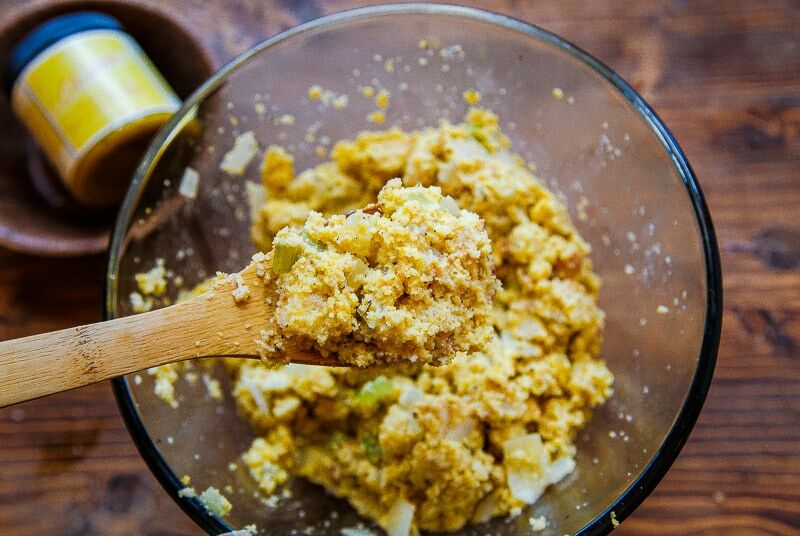 Southern Cornbread Dressing. This is the only dressing recipe my family has ever made! This is the best recipe I got; it’s all here, folks. I may turn out the lights on this blog after sharing this. I saved this recipe for years to put in my second cookbook. There’s a ‘Thanksgiving for Two’ feast in the book, and this cornbread dressing is in it, albeit in a small pan for two. Here, I doubled it to serve 4-6 for our small Thanksgiving series we’ve got going on. You can use the oblong pan in the photos, or an 8×8 baking dish. The pan I just linked you to has a lid, so if you’re doing a potluck Thanksgiving, it’s perfect for you! I have a Thanksgiving for Two series, and a collection of Thanksgiving Recipes Sides for you to enjoy. Like all good things, this recipe is first my Mama’s. 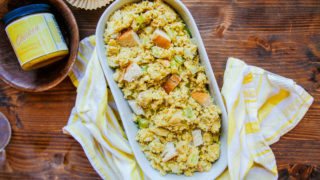 She says she clipped it from a Southern Living magazine decades ago, and quite frankly, it’s the only type of dressing or stuffing I’ve ever tasted in my life. I don’t need to try any other dressings; this is as good as it gets. 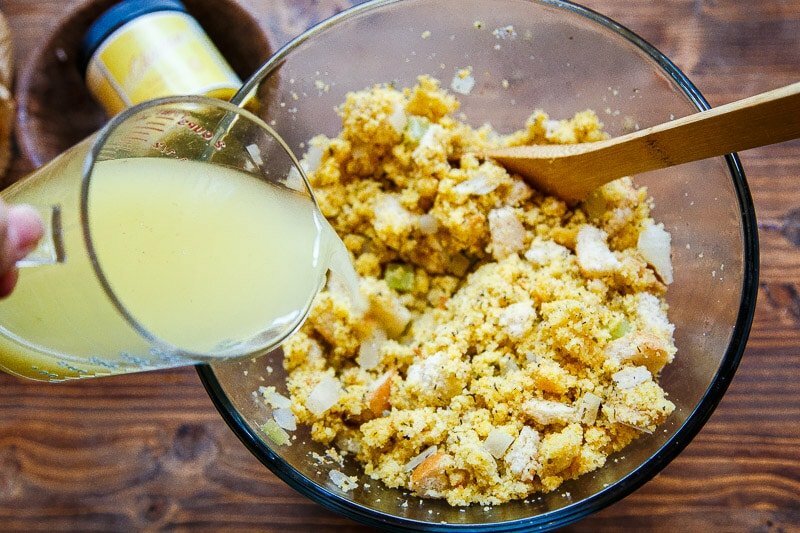 This cornbread dressing is the reason people drive for hours all over Texas to descend on my parents’ house for Turkey Day. Once you taste it, you will beg for an invite. The thing is, I think this dressing recipe addresses every problem that can happen with other recipes. 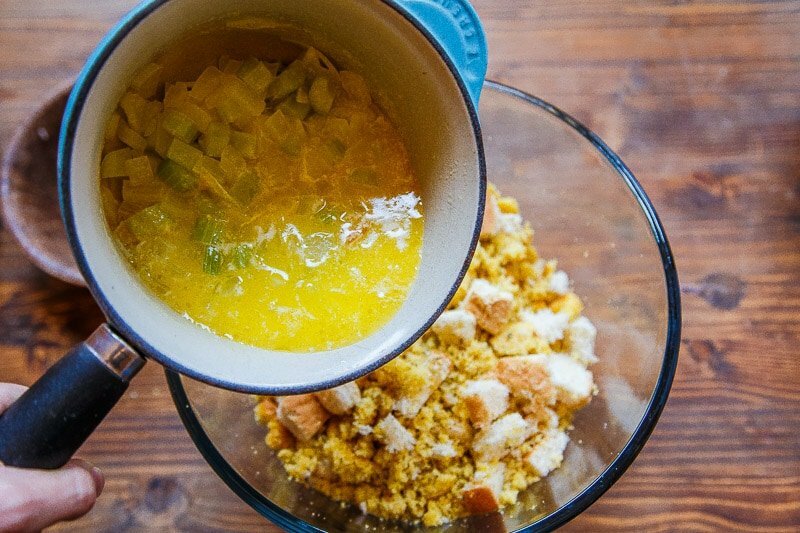 The crumbled cornbread and bread cubes are left out overnight to dry, so the dressing is never too wet. There’s milk, eggs, and chicken broth to make sure it’s never too dry. While other dressings might bake up flat and dense, this one has eggs for lift and fluff. Any potential set-backs to enjoy this carb-loaded, best-part-of-Thankgiving, I-might-skip-the-turkey-for-this-recipe have all been precariously planned for and diverted. The spices are doubled and tripled what they used to be in the original Southern Living recipe, and still, I manage to amp them up every time I make the recipe. It just keeps getting better. Come to my house in 10 years, and I’ll be adding an entire cup of sage. If you make this, you can address all fan mail to my Mama. I understand that no other dressing recipe will ever grace your table after you taste this one, so if you want to start a social media revolution and send me snaps, instagrams, and tweets of you burning the recipe card with your previous stuffing recipe, we can totally do that. 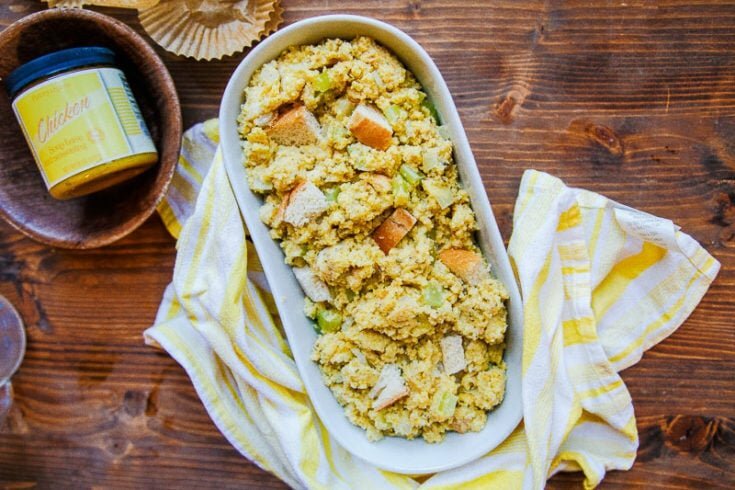 You can find me anywhere in social media with the name ‘dessert for two.’ I’ll be waiting for you; that’s how good this Southern cornbread dressing recipe is! 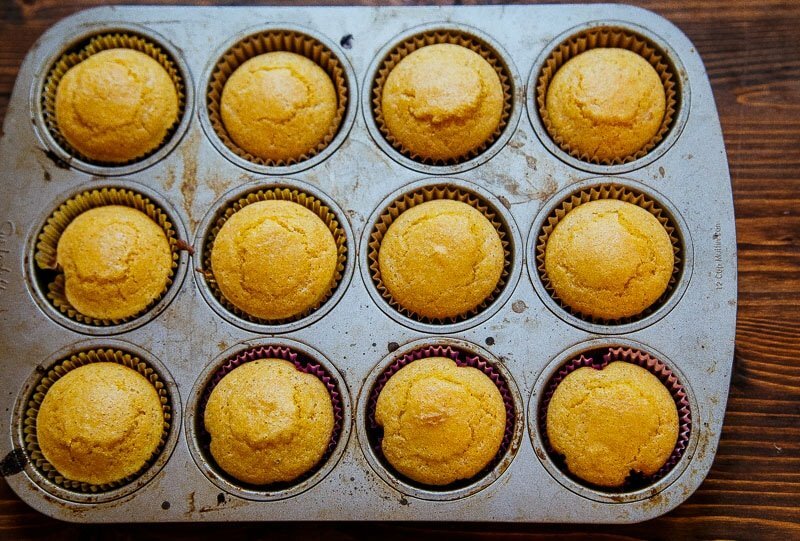 The recipe first starts with a batch of cornbread. You can use packaged mix like my Mama does, or you can use my small batch of cornbread, doubled. I baked it in 12 muffin cups, but you could also do an 8×8″ pan. First, combine the dry ingredients: flour, sugar, cornmeal, baking powder, baking soda, and salt. Next, stir in the buttermilk and egg. 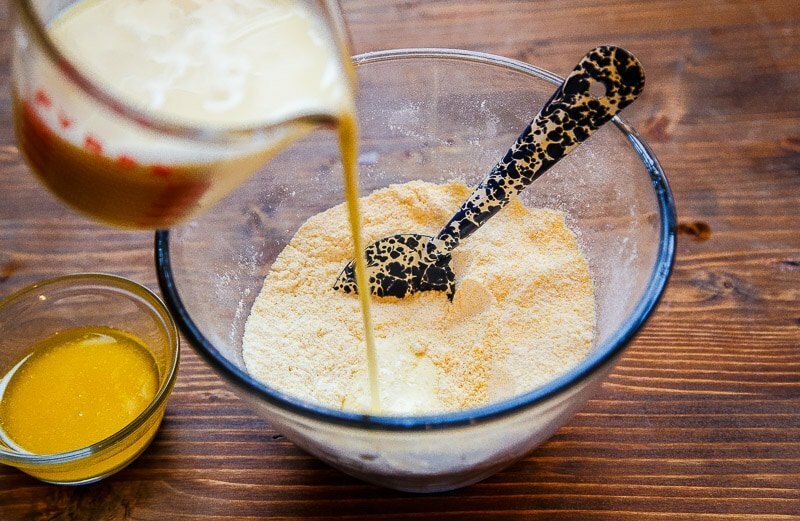 (If you need a recipe to use the extra buttermilk: small batch biscuits). Finally, add the butter. See all the bubbles starting to form in the batter? That’s because buttermilk is magic. 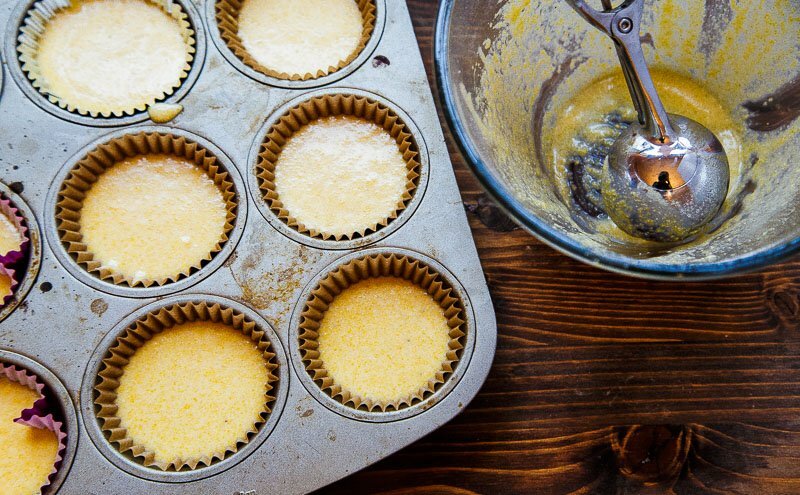 Divide the mixture into 12 muffin cups, or use an 8×8″ pan. Now take all the pretties and crumble them up–some large chunks are fine. Now cube 4 slices of white bread. This is literally the only time I ever buy white bread. 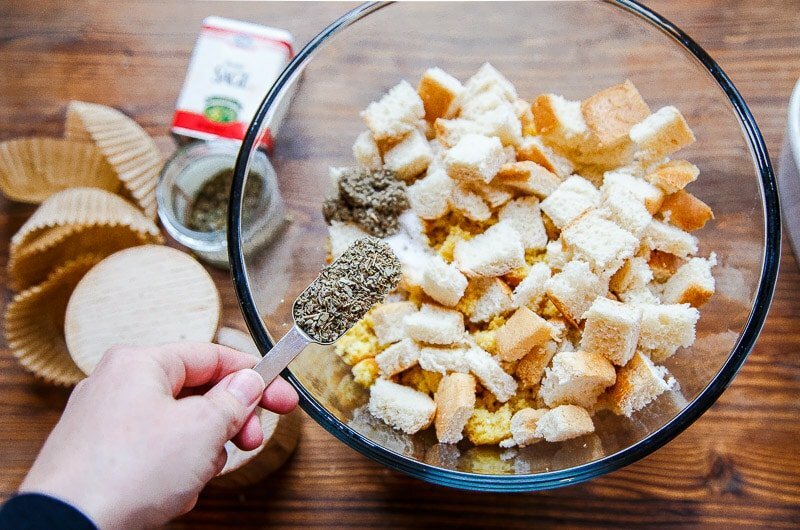 To the crumbled cornbread and bread cubes, add the spices and salt. It’s supposed to be 1 1/2 teaspoons of rubbed sage and 2 teaspoons of poultry seasoning, but I’m clearly adding an entire tablespoon. You just can’t over-spice it. Also, don’t skimp on the salt: 1 1/2 teaspoons is perfect. So, this is the part that is ideally done the day before. My Mama leaves her bread and spice mixture out overnight on the counter to go stale. If you didn’t plan ahead, dry it in the oven to 10 minutes while the oven preheats. Now, this next step is a bit weird, but stay with me. We’ve come this far. 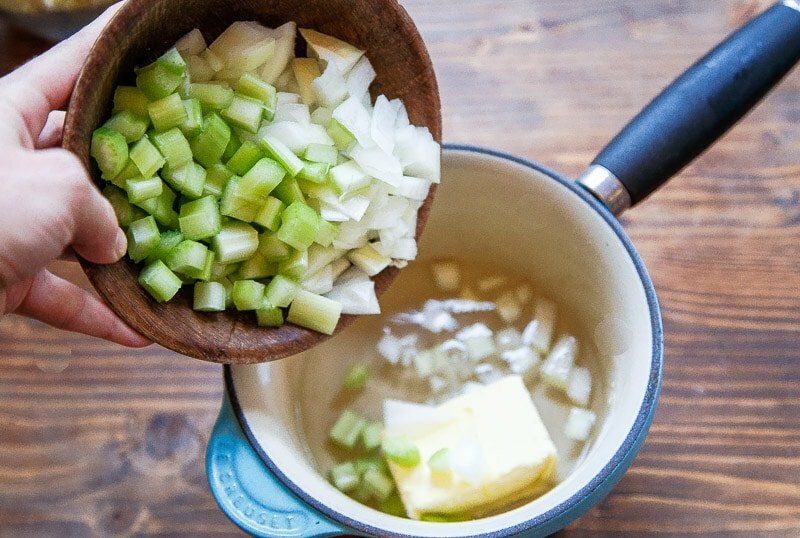 You’re going to saute 2/3 cup of onions and celery in 6 tablespoons of butter plus 2/3 cup of water. 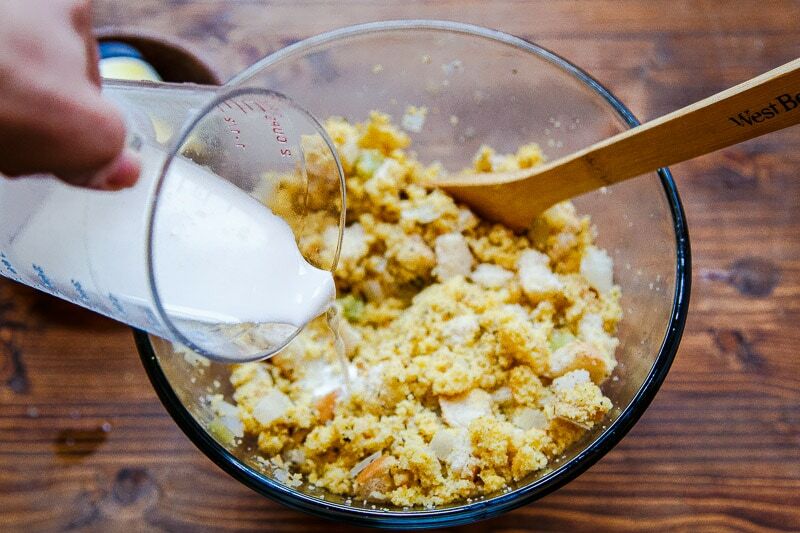 I know it’s weird to saute in water, but trust me in this Southern Cornbread Dressing quest. Saute for about 5 minutes to soften the veggies. Add 1 1/2 cups chicken broth or turkey broth. Add 1/2 cup of milk. And two beaten eggs. I suppose you could beat the eggs into the milk and add them, but then you’d miss out on another blurry photo opp. When you stir it all together, it will be very moist. Don’t worry your pretty little head over this. Scrape it all into a dish. I used this oblong one, but it’s equivalent to an 8×8″ square pan. Perfect dressing for 4-6 people! Don’t smoosh and flatten the dressing. The craggy top develops a great crust. Bake at 400-degrees for 20 minutes. Taste. Tell me it’s the only Thanksgiving dressing recipe you’ll ever need in life. Amen. Preheat the oven to 400. Line a 12-cup muffin tin with 12 liners, or have ready an 8x8" square dish. 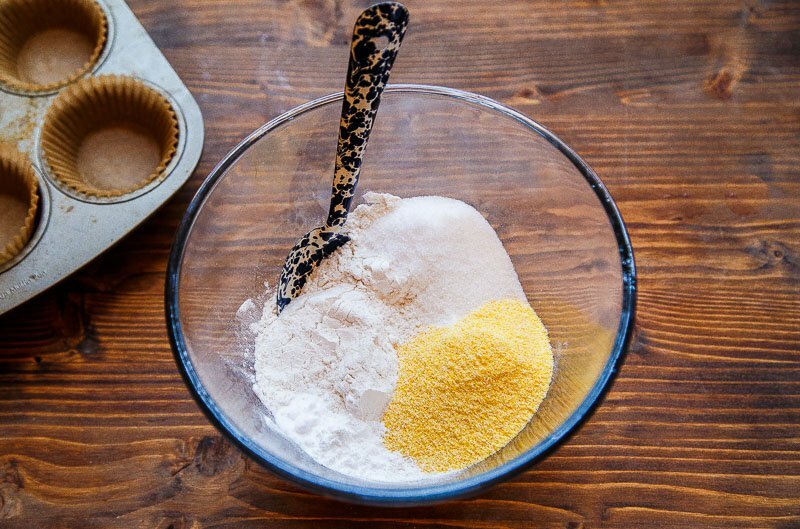 In a medium bowl, whisk together the cornmeal, flour, sugar, baking powder, baking soda, and salt. 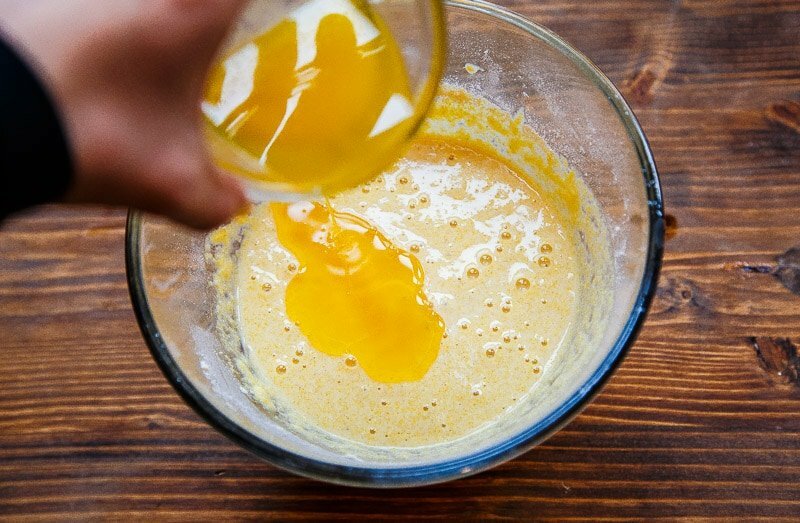 In a glass measuring cup, beat the eggs into the buttermilk and add to the dry ingredients. Stir until combined, and then stir in the melted butter. 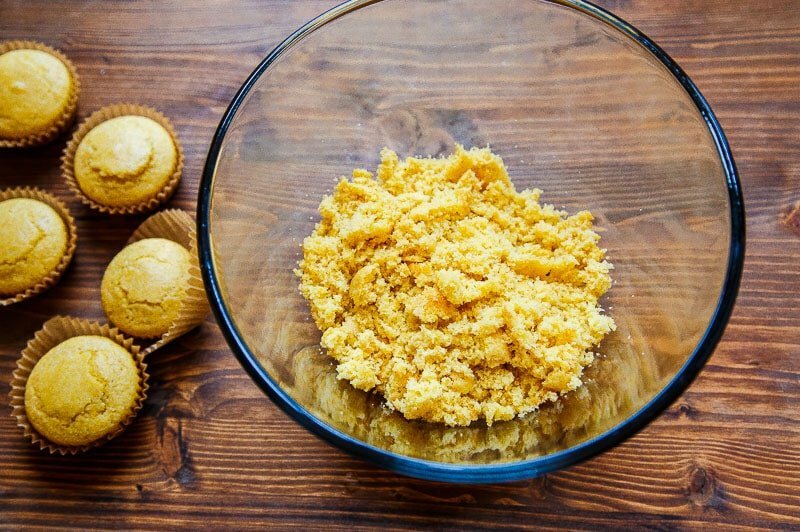 Divide the batter between the muffin cups and bake for 12-13 minutes. The muffins are done when the tops spring back when pressed on. Keep the oven at 400. 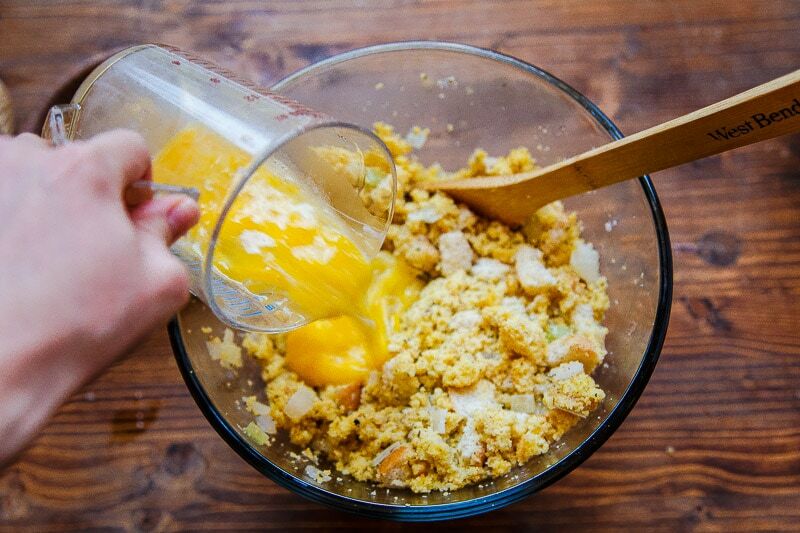 Now, make the stuffing: crumble the cornbread muffins into a large bowl. Large chunks are okay. 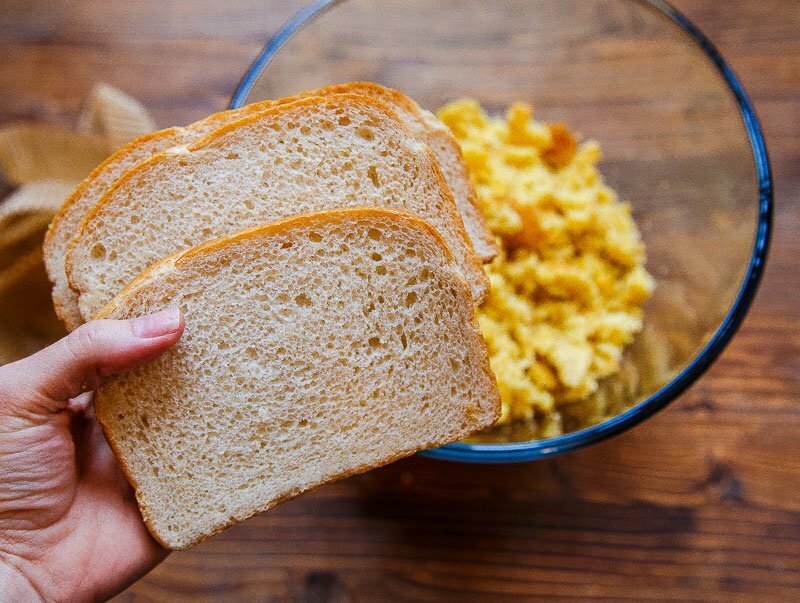 Dice the bread into 1" cubes, and add it to the bowl. Stir in the salt and spices. You can do this a day ahead of time, and let it sit out on the counter to go stale overnight. Or, you can dry it in the oven while it preheats. Next, in a small sauce pan, add the celery, onion, water, and butter. Saute over medium-high heat for about 5 minutes, just to soften the veggies. There will be a lot of liquid in the pan. Pour the liquid over the cornbread and bread cubes. Stir well. Stir the chicken broth into the bowl. Next, beat the eggs into the milk, and it to the bowl, too. Stir everything together very well. Pour into an 8x8" pan (or equivalent). Do not smooth the top--rough edges are desirable. Bake for 20 minutes. Let cool 10 minutes before slicing and serving. Thanksgiving is my favorite holiday and you’ve been killing it with these small thanksgiving recipes. I can’t wait till I’m home from college in my Mama’s kitchen and can make this because it looks incredible. And my Mama has ingredients and a nice kitchen. I have no ingredients, a stove with two settings (too hot and even hotter) and an oven that doesn’t work. College. This is calling my name. Cornbread stuffing here I come! This is very close to the recipe I make. I use brioche bread instead of white bread and no one knows it’s not all cornbread! And a good friend gave me a tip: Make the recipe the day before and let it sit in the refrigerator all night, then bake it. Saves you last-minute work and it’s tastes even better. I agree, Jim! My Mom sometimes refrigerates it overnight, and I swear it tastes even better. Thanks for sharing! You’ve totally convinced me girl! 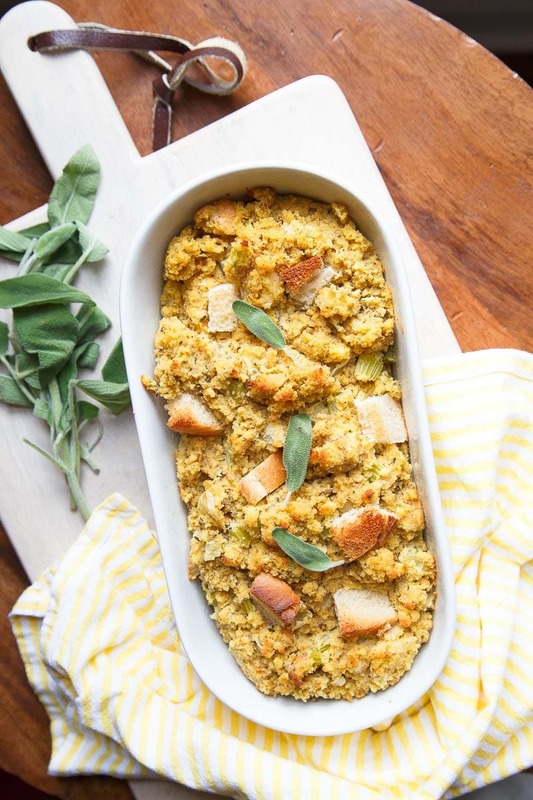 I definitely need to try this – I’ve never had a cornbread stuffing. Thanks for this! Because of living in different states, we haven’t had thanksgiving with my parents in almost a decade. We are going this year with our two toddlers. Thanks for this recipe. You see, my mom is celiac and my dad has gone vegan but dear God, we need some delicious herby carbs! Can’t wait to try it. This sounds so much like the dressing I grew up with, and haven’t been able to recreate. You just made my Thanksgiving! Thank you! Mushroom stock sounds amazing! I’ll have to give it a try! I almost cried when I read your Mama’s Cornbread Dressing Recipe because I believe it to be the same recipe that my Mama used to make the most delicious Southern Cornbread Dressing ever! I knew I’d found the right recipe when it included Milk and Poultry Seasoning. My Mama is still alive, but she has Alzheimer’s Disease and, unfortunately, she never wrote her recipe down (she always made it by heart), and I never got the recipe from her before she forgot how to cook. :( I believe that the only difference between your Mama’s Recipe and my Mama’s Dressing is that she added Chopped Walnuts to her Dressing. Thank you so much. You’ve made my Thanksgiving Day! Have a Happy Thanksgiving Day as well. Full-size Recipe from your Mama. My sister is so happy to get the recipe as well. Btw, I liked your Page and Shared it on Facebook. I live alone so Recipes for Two are perfect for me ( and if I get a boyfriend/husband they will work even better!lol) I want to buy your cookbooks! Thanks again Christina! Your Mama’s Cornbread Dressing was the hit of my Thanksgiving Day Dinner! I’ve promised some friends to give them the recipe! One of my guests said that “she has never had stuffing that tasted like mine and that it was the best she’s ever eaten!” I felt so proud. It tasted just like my Mom’s! I definitely had a Happy Thanksgiving Day! God Bless You. My “recipe” is basically the same, but I always add country style sage sausage just as my mom did. Pinning! Probably a little late but I was hoping you could share the full size recipe? Wish I had seen this earlier because it sounds amazing! May just end up making the small one if you aren’t able to post it! I never really write comments, but I’ll admit, I get frustrated when I read through comments trying to find out if people have made it and what they think and don’t find many or any at all. This goes out to any future browsers thinking about trying this on your own. Plain and simple, this recipe is ridiculously delicious!!! Like, mmmm hmmm, delish! Like just heavinly sigh, delish. I was hoping for the small recipe as there is only 2 of us. ???? It is a smaller batch. It’s normally made in a 9×13 pan. Trust me, I know you’ll love this one and won’t mind 1 day’s worth of leftovers. Cornbread dressing freezes and reheats really well too! I make too much on purpose so I can have it as a cozy dinner later in the winter! SOUNDS ALMOST LIKE MY MOTHERS’ DRESSING,EXCEPT SHE ADDED WATER CHESTNUTS TO HERS….THANK YOU FOR A WONDERFUL TREAT…. I have never made homemade stuffing before, but didn’t want to make a great big pan full. I made this today for a trial run before Christmas dinner. Turned out great! Thank you for this recipe! I would love to make a full size batch of this for my family next Thanksgiving! Have a question. The measurements for meal and flour – are they for recipe for two, or you doubled – were all ingredients doubled? Recipe appears as only meal/flour were. Maybe I’m just misreading! Thanks. Hi Dorothy! The recipe is correct as- written. I know what you mean, and sorry for the confusion!